The central bank has indicated that it will soon take punitive measures against Menzgold Ghana Company Limited. According to the Bank of Ghana (BoG) Menzgold, which is known as a precious minerals trading company, is carrying out unlawful transactions by taking deposits. Menzgold is currently operating with a license granted it by the Minerals Commission and the Ministry of Lands and Natural Resources. The central bank maintained that Menzgold is in breach of section 6(1) of the Banks and Specialised Deposit-Taking Institutions Act, 2016 (Act 930). 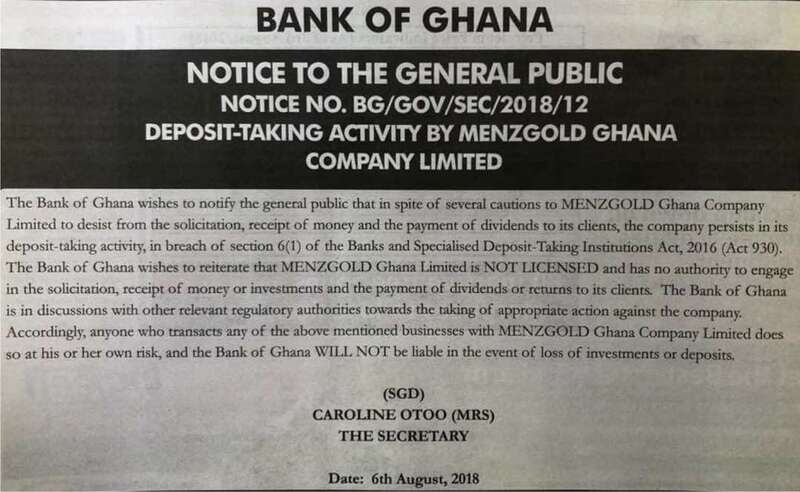 BoG further said in spite of several warnings to the company, Menzgold continues to engage in the illegality; hinting that discussions were already underway with regulatory authorities to enforce the appropriate action on the company. The central bank, however, cautioned the general public against transacting business with Menzgold. (1) Subject to this Act, a person shall not carry on a deposit-taking business in or from within the country unless that person is a body corporate formed under the laws of this country. (2) A person that is not a body corporate formed under the laws of the country may, with the prior written approval of the Bank of Ghana, carry out a deposit-taking business in or from within the country. (4) The Bank of Ghana shall issue directives to govern the operations of persons exempted under subsection (2). (5) For the purpose of this Act, deposit-taking business means the business of a) taking money on deposit and making loans or other advances of money; and (b) financial activities prescribed by the Bank of Ghana for purposes of this definition.